In 2002, the broadcast networks produced 135 of 182 series; pay cable accounted for 17, and basic cable networks produced 30. In 2009, there were just a few online series. Today, there are nearly 100. Today–just seven years later–basic cable networks produce more original series than broadcast networks. In part, that’s because there are so many basic cable networks, and in part, because so many of them are now producing original material. Of 455 original series on U.S. television, online services are now responsible for about 1 in 5 of them. But check out the trend: in 2013, there were 24 original series available online. In 2015, that number had basically doubled to 46, and it doubled again a year later. If the trend continues, 2017 will be the year when basic cable and online services produce an equal number of original series, and 2018 will be year when online services produce more original series than any other U.S. “networks” (we lack an English-language term that describes both online services and television networks). These numbers count only “scripted original series” and do not include daytime dramas, specials, children’s programs, short-form content (less than 15 minutes), or programs not produced in English. If we add children’s programs–Nickelodeon, Disney, etc.–the numbers change, probably in favor of basic cable now, and online services in a year or two (all are stepping up). These numbers do not count non-U.S., and we’re certainly seeing this shift in other parts of the world. A global chart would be wonderful, but then, so would U.S. access to programs shown throughout the world (the arrow typically points from the U.S. to others). For now, the basic cable networks seem to be holding steady at about 175-185 series, and the same is true for broadcast networks at about 145-150. Ditto for the pay cable services at about 35 original scripted series per year, but look at those online services grow! Can’t help but wonder how these supply numbers compare with demand. If we were to chart hours viewed per week, I wonder whether the horses would finish in this order: basic cable, broadcast, online services, pay cable. I’ll try to find an answer. Meanwhile, readers, if you can help with that side of the equation, please do. Tubi TV Teaser from adrise on Vimeo. Although Netflix, YouTube and other video providers offer a whole lot of stuff, I’ve often wondered where the other stuff resides, why we’re not seeing so many old TV series and movies, and why so little that is produced and distributed outside of the U.S. is offered to U.S. audiences. When it launches in the U.S. this summer on multiple platforms, it is expected to be free (ad-supported). The old ratio was 3 by 4: a reliable compression of reality, the extra window in every household that looked out at the world. It offered a limited view, controlled by powerful producers and directors, versatile performers, intense journalists who learned the trade by explaining why and how the Germans were bombing the guts out of London during World War II. Very few people were allowed to put anything into that window: NBC, CBS, ABC and a few local television companies controlled every minute of the broadcast day. It was radio with pictures, a new medium that learned its way through visual storytelling when the only colors were shades of grey. The new ratio is 16:9, and it seems to accommodate just about anything anybody wants to place in that frame. And the frame travels with us everywhere: on phones, tablets, on Times Square, on airliners and in half the rooms of our homes. In offices, too. There is little cultivation or careful decision making. If you want to make a video, you point your phone at anything you please, press record, and then, fill the frame with stuff that moves and makes noise. As curmudgeonly as this may feel, I think I’m happier reading a book. In fact, as media abundance increases, I find myself withdrawing into a very different series of rectangles—ones that don’t include advertising, don’t include pictures, don’t move or make noise. I’m now buying books by the half dozen—about as many as I can carry out of the increasingly familiar gigantic book sales that offer perfectly good volumes for one or dollars a piece. I like the idea that the person who wrote the book is either an expert in his or her field—otherwise, the publisher never would have agreed to the scheme—or a superior storyteller—one that the editors, and the publisher, deemed worthy. I love the idea that the author writes the book and then hands it off to a professional editor, one with literary taste and an eye for clear, precise phrasing, and that the book then goes through yet another reading by a copy editor who makes sure the words and sentences are provided in something resembling proper English usage, and that, after the book is typeset, another editorial staff member proofreads the whole book and causes any number of errors to be corrected. When the book reaches my hands, I am confident that the work is, at least, well-manufactured. Might it be any good? At a dollar or two, I’m not sure I care, but I do choose my books, and my authors, with care. Somehow, I feel that my side of the contract is to spend a bit of time selecting, just as I do before I decide that I should devote two hours of my life watching a motion picture. When I find a wonderful film—not always easy, but always worth the effort—and it fills a 60-inch Samsung plasma screen with magic—I am thrilled. Most often, those wonderful films are made by people in other countries, or by smaller companies in the USA, or by animators. Just as it’s unusual for me to stumble into something wonderful in the land of books that is newly released, the films I watch are usually a few years old. Not really old, though those are fun, too, but old enough that I can get a sense of whether they had any staying power beyond the echo of their opening weekend. I was happily surprised by the depth of the storytelling when I watched Emma Thompson and Tom Hanks pretend they were P.L. Travers and Walt Disney during “Saving Mr. Banks,” for example. Do I care that a film was an Academy Award contender this year? Not really, but when I see the words Pulitzer Prize or Man Booker Prize on a rectangular book cover, I always give it a second look. There is a qualitative difference, I suppose, even if it exists only in my own prejudiced, confused, 20th/21th century mind. What about flimsier rectangles? Magazines remain interesting, and it’s difficult for me to get on a train without finding something I want to read at the newsstand before boarding. Whether it’s The Atlantic, The Economist, The New Yorker, Harper’s, MIT Technology Review, or a dozen others, I sense that I am reading the work of a well-organized editorial culture, and that is presented in a form that suggests substance. When I read an article on a screen, the medium itself feels temporary, and rarely impresses me with the gravitas, or the well-honed humor, that these magazines (okay, some of these magazines) routinely provide. The other flimsy rectangle—very, very flimsy in its form, in fact—is the newspaper. Sadly, few local newspapers possess the resources or clarity of focus that they did decades ago. Their industry has been devastated by technology and wickedly poor leadership decisions. Then again, there is still nothing better than reading The Sunday New York Times for half of the weekend, often with enough left over for Monday, or maybe, Tuesday morning, too. Except, perhaps, a good fresh New York bagel beside the paper. In a pinch, I can find similar joy in the morning with the Boston Globe, The Washington Post, the International Herald Tribune, or whatever quality paper is nearby when I’m away from home. The Wall Street Journal’s weekend edition is every bit as good; after I finish today’s Times, I will work my way through the remaining sections of my new Sunday habit. Interactive rectangles are something else again. Tablets, and smart phones, are wonderful, and I use them every day, but mostly for media creation (I write this blog, etc.) than for reading (eBooks, HuffPost, etc.). If I want to read, to seriously read, I guess I’ve learned to prefer it in print. And if I want to watch a movie, or a TV show, unless I’m on a train or plane, I would just as soon watch it in a comfortable chair with a nice large screen to fill part of a family room wall, and not listen to it through dinky speakers or a less-than-comfy headset or earplugs. Who cares? Not sure, but I thought I’d put some ideas on a digital screen that I, for one, would prefer to read in another medium. Since that other medium has gatekeepers, and because few print publishers would allow me to zig from media theory to watercolors to interest gadgets to public poverty policy, then zag to book reviews or notes about recent jazz CDs that I think you should buy, I’m happy writing into a glass box, and I hope that doesn’t cause you too much inconvenience or discomfort. Sorry to go so long this time. Without an editor, or an editorial hole to fill (love that term), I just wrote until I felt I had made said my piece. I like the phrase. It was used to describe the way Americans are forced to subscribe to cable television–if you want cable, you must pay for a tremendous number of unwanted channels. In the industry, the result of unbundling is called “a la carte” cable service because the operator allows you to select, and pay for, only the channels that you will actually watch. Bundled cable is, of course, the reason why Comcast accumulated enough money to buy NBC and Universal Pictures. It’s a sweet deal for cable operators, and for the cable industry, which is funded by selling products to people who don’t want them, but cannot do anything except, to use an example, buy everything in the store in order to make sure they have access to the loaf of bread and the jar of peanut butter. It’s a brilliant marketing scheme, and an utter failure of anything resembling consumer protection in the United States. Subscribers to Rogers Cable in Canada can select from these a la carte channels. Most are not big name channels, but once the a la carte habits gains a foothold, the entire cable business may change. (Reuters) – A transformation in how some Canadian cable TV companies sell channels to consumers might be a sign of things to come in the much bigger U.S. market. With “a la carte” pricing, cable companies are offering Canadians an alternative to “take-it-or-leave-it” bundles that effectively force viewers there – and in the United States – to pay for channels that they do not watch in order to get access to those they do. Two weeks ago, The New York Times ran an article entitled “A Quest to Save AM Before It’s Lost in the Static.” The average listener to NPR is 56 years old, and new ones aren’t coming on board so quickly because of music services like Pandora. The big question that broadcast television executives are asking is whether there is a future for local television broadcast stations. In fact, the FCC is asking the same question, anxious to buy back a bunch of local television spectrum and sell it to the wireless operators because they say they represent the future. A century ago, we were trying to imagine a world where broadcast radio and television stations might someday exist. Now, we’re wondering whether we need them at all. I really love this picture of a 1965 AM radio. It comes from a Ford Mustang. To see more, click on the radio. I suspect AM and FM radio are easier to defend because they provide news, sports, weather, emergency information, and entertainment for people on the road. Half of radio listening happens either in a car or a truck (the rest happens at home, and to a lesser extent, in workplaces). Once an also-ran, FM is now the most popular part of the radio band. Music sounds much better on FM than AM radio, so AM is used, mostly, for talk, news, and religion (you knew that). Following the audience, many sports teams have moved to FM, leaving the AM landscape that much more barren. The New York Times article describes an effort to upgrade AM radio, an improvement requiring the replacement of every car and home radio. That seems as unlikely as the replacement of analog television seemed just a few years ago. But we did it. The digital television transition moved some local broadcasters to other channels (“masked” with their old TV channel IDs so you never noticed), improved some signals for some households (worsened some signals for other households), and greatly increased the available television channels that could be transmitted by a single television station. Most network affiliates have made little meaningful use of additional bandwidth, but MeTV, retroTV, and Antenna TV are among the entrepreneurial newcomers that make use of the additional bandwidth. A handful of new non-commercial public networks have emerged, including several importing programs or full channels from other countries including Japan and France. Where does this lead? And how do we even begin to think about the future when so much television viewing is now on-demand and so much audio listening is via Pandora, podcasts, Sirius XM, and audible? Let’s start with the audio side. Traditional radio listening is probably entering its final innings. The disruptive technology is mobile internet. It’s no longer a techno-stretch to include an internet device in an automobile or truck. Hundreds of channels are replaced by thousands. On-demand replaces scheduled programs. ANy smart phone doubles as an audio file server, easily replenished via the cloud, and, with increasing reliability, the cloud itself becomes the server as the driver enjoys a live stream without considering its source. Program your vehicle with voice-activated instructions, and the car will know you prefer Car Talk on Tuesday mornings during your commute. Brands matter, podcasts matter, but 24/7 feeds of country music and local news breaks don’t, or won’t. Press a button to see and hear local traffic conditions with appropriate automated warnings, and suggested re-routings. Sirius XM is trying to stay ahead of the curve by selling its own internet channel packages, and starting its own on-demand services. Good idea, but a half dozen companies will offer, more or less, similar subscription services, and, of course, everybody is competing with free (free has been the standard for AM and FM radio, and old habits are hard to change). Add audiobooks and podcasts to the mix, and the AM/FM prognosis becomes even more gloomy. What about TV?With few exceptions, people watch programs, not networks. New matters less than buzz. If you haven’t seen it yet, last season’s Boardwalk Empire trumps this season’s Girls. There is so much product, so much fragmentation of viewing time, everyone plays catch-up almost all of the time. Catch-up has the potential to transform large numbers of viewers into video library consumers , not television viewers who know or care what’s on NBC on Wednesday nights at 9PM. In fact, if there was no broadcast television, viewers would quickly find alternatives on cable, on demand, and various internet services. Which is to say, 20th century television is probably enjoying its last laps. We just don’t need what we had before–there are better alternatives. With broadcast radio and broadcast television, we established and continue to enjoy a public trust. As members of the public, we provide broadcast spectrum, at no charge, to the likes of CBS and its local affiliates, and they provide a mix of news, entertainment, and other useful or interesting stuff at no charge. The whole thing is monitored by an FCC that is not perfect, but generally watches out for abuses, and the public’s interests. That’s all good, and that’s in the process of going away. In its place, there is no public trust, no assurance of an appropriate mix of news, entertainment and other useful or interesting stuff, and almost none of it will be provided at no charge. We are making a VERY POOR choice. We have missed a step. We are handing our mass communications to companies whose principal business is collecting monthly fees for services, not attending to the needs of the communities they serve, not attending to any national agenda or public interest. We have already seen bad behavior from operators who wish to constrain what is and is not made available through their commercially-controlled networks. We will see more control–all quite reasonable because these companies are not required, nor encouraged, to do good. They are required (by shareholders) and encouraged (by advertisers and subscribers) to keep the public interested, to capture our imagination and attention, but not for anything resembling good reason. In short, we are missing a step. You and me, we have some interests to protect here. We should be unwilling to transfer control of all media to companies with no meaningful public interest requirement. Let’s think about that. And let’s continue the conversation in the near future. So here’s Kevin Spacey telling the truth about the television industry, the movie industry, and the new reality that places creative people in control of their relationship with the audience. He is harsh, realistic, funny, and deeply experienced–and full of wisdom and insight gained through his Netflix deal, his work with the Old Vic theater in London, and a career that began, with the help of actor Jack Lemmon, at age thirteen. I especially enjoyed Spacey’s celebration of “the third golden age of television” that began, more or less, with Hill Street Blues, extends through The Sopranos, on through House of Cards. Just in case you’ve missed one or two, he runs through a dozen-plus excellent television series whose connection to the audience is the result of powerful creative risks taken by creative people, and by the small number of laudable television executives with the guts to protect those creators. Spacey connects the dots in a pattern that’s obvious to anyone who is willing to face the truth about the television industry–and devastating to those who still believe in the status quo, appointment viewing, watercooler conversations, and television networks as the fundamental organizing principle of the home entertainment industry. Time and again, he celebrates the creative people…and resets expectations for the next generation. The James McTaggart Memorial Lecture opens the Edinburgh Festival. This lecture is 49 minutes long. I encourage you to watch the whole thing. Let me tell this another way: he tells a heck of a good story. 4K TV – Sooner Than You Think! A few days ago, I was on the phone with the FCC and an interesting question came up. Will broadcast stations have enough over-the-air bandwidth to provide 4K service to the public? I was struck by the question because 4K is such a new idea, and because I’d never really thought about it as broadcast idea. Compare 1080 pixels (dark green0 with 4000 pixels (red) and you get a sense of how much more picture information (resolution, detail) is available on the new 4K TV sets. What’s 4K TV? It’s a much higher-resolution version of HDTV. And the first 4K TV sets are arriving soon (see below0. In order to provide all of that picture information, more data is required, which means larger storage devices, and, in order to provide that data to connected TV sets, more bandwidth is required, too. That’s the basic theory, but it’s important not to think about 4K in terms of the current systems because of that always-astonishing digital magic trick: compression. Yes, 4K requires a lot of data and a lot of bandwidth. But “a lot” is a relative term. And yes, there are new digital broadcast standards on the way. Good news for consumers and for broadcasters, who will be able to pack more and prettier program material into their TV signals, not-so-good news for broadcasters who are attempting to build a coherent strategy related to the upcoming FCC TV spectrum auction, in which many stations will trade their licenses for cash, or for the opportunity to share a channel with another broadcaster in the market. Anyway… I woke up this morning to an announcement from Sony… with all sorts of enticing promises: improved detail, improved color rendition, better audio, screen mirroring so what’s on your tablet can be viewed on your new TV (albeit it in lesser detail, a service currently available to Apple users). How much? $5,000 for the 55-inch model, and $7,000 for the 65-inch model. What are you going to watch? Well, yeah, that’s always the problem at this stage. Here’s a terrific article about “upscaling” the currently available media, which seems to require 24x improvement. More data will require more robust local storage, and so, we move closer to a complete convergence of television, home network, home digital storage devices in sophisticated home library systems, and, perhaps far more likely, streaming solutions in their next phase: advanced versions of Netflix, Hulu, and so forth, tweaked to serve big files for 4K TV sets. Which brings us back around to the TV station wondering about its 4K future. Sure, it’s technically possible to broadcast 4K, but in the few years remaining for the current broadcast standard, this seems fairly unlikely because (a) it will be expensive for television stations to install in their master control facilities, and (b) relatively few people will leap from their new-ish HDTVs to 4K sets in the next year or two. Josef Adalian wrote a very provocative article about NBC and the network prime time model in his Vulture column for New York magazine. Based upon both prime time flops and shifts in audience attention, he wonders whether the network model is still viable, and if so, how much longer it will survive. It was far easier to climb out of the Nielsen basement when there was just a handful of legitimate competitors. Now NBC is fighting for eyeballs at a time when millions of viewers don’t even watch TV on TV. You can buy the “NBC Stress Toy” from the NBC Universal Store. Just click on the image. Adalian presents a case that’s based upon three key factors: (a) NBC is performing very poorly throughout its prime time schedule, (b) temporary short-term solutions have masked the truth for several years and (c) the media environment no longer allows the kinds of turnarounds that ABC, for example, achieved when LOST, Desperate Housewives and Grey’s Anatomy all caught fire after the responsible programmers were long gone. With all of the noise from so many media outlets, Adalian discounts even the potential of star vehicles and the old tentpole strategy (Cosby and Seinfeld, for example). Networks can pretend all they want that the broadcast model isn’t broken, but denial didn’t forestall the end of big record-store chains, and it didn’t save Borders Books or Hostess. Five or ten years from now, there’s a good chance we’ll recognize NBC as the Peacock in the coal mine. Buying a new television set is not easy. Some stores tweak the settings of their TV sets, some tweak the lighting, some show the sets with no adjustment whatsoever, and others optimize to make each set look great. Of course, all of this is utter nonsense because no store can reproduce the environment where you will be watching at home. The next time you visit Best Buy, do not make any judgment about brightness, color rendition, or other qualities of the image–whatever you see in the store, it won’t be what you see at home. There is one thing you can do in the store, of course. You can stand in front of the screen and wonder whether the set will be too big, too small, or just right for your room. Actually, you probably shouldn’t stand in front of the screen. Instead, with the set at eye level (not mounted six feet above your head), you can make a reasonable judgment. Here’s how. Sure, we’re Americans! We love our television screens!! We want them as large as possible!!! (You’ll find article after article insisting that bigger really is better. For some people, that’s true. For most people, nose-to-screen distance is not more than 9 feet–not 11 or 16 feet as in our illustrations above). Add 10 or 20 percent if you’re VERY serious about sports or movies. Add 50 percent if your entire life revolves around a home theater. No doubt. Certainly, many retailers would certainly prefer that you buy a set that costs $2,000 or so instead of $1,000 or less. For most principal viewing conditions, a TV in the 46-55 inch range will be suitable. For a bedroom, the answer is probably under 40 inches. Hey, one more thought. There’s a lot of confusion about LED vs. plasma screens, and if you’re not lucky enough to connect with a knowledgable floor sales person, you could make a poor (and heavy) decision in the wrong direction. LED sets are bright and ideal for rooms where there’s lots of ambient light. Good for spots, not so great for movies because their color rendition is, well, extended and somewhat unnatural. Plasma sets are not as bright, but they do a better job with skin tones and lifelike color rendition. But they run hot, use more power than LED sets, and tend to be heavier, too. If your room has any significant ambient light (coming from windows or fixtures), you may be spending a lot of time fighting reflections. For several years, plasma sets were not popular, but a renewed focus on this technology, especially from Panasonic and Samsung, has resulted in plasma screens now widely available, even from big box retailers. Before you buy, study the reviews. Editorial reviewers have the benefit of seeing many sets under the same (simulated real world) viewing conditions, so their comments are often more meaningful than the advice of people on the sales floor. I think cnet does an especially good job with TV reviews. One more thought. I’m sitting here writing on a 21-inch iMac, a computer whose screen I regularly use to watch videos. The screen is not much more than a foot from the tip of my nose, so there’s no way that my formulas make any sense for those of us (lots of us) who watch videos, and the occasional movie, in this way. That makes me wonder whether we’re again crossing the great digital divide to some new way of thinking about the relative sizes of humans and their screens. Maybe our next screens will seem small at 100 inches. Maybe one wall of every room will be a TV screen. Heck, maybe every wall of every room will be a screen. Lots to think about! History marked time for one memorable hour today, and within its span, the promise of the greatest of all the miracles of mass communication became a reality. At 4:30 PM, Eastern Daylight Time, color television’s triumphal entry into the public domain was emblazoned officiallyacross the log of man’s progress. In the 60 minutes that followed, this newest ,miracle among the electronic marvels was born. 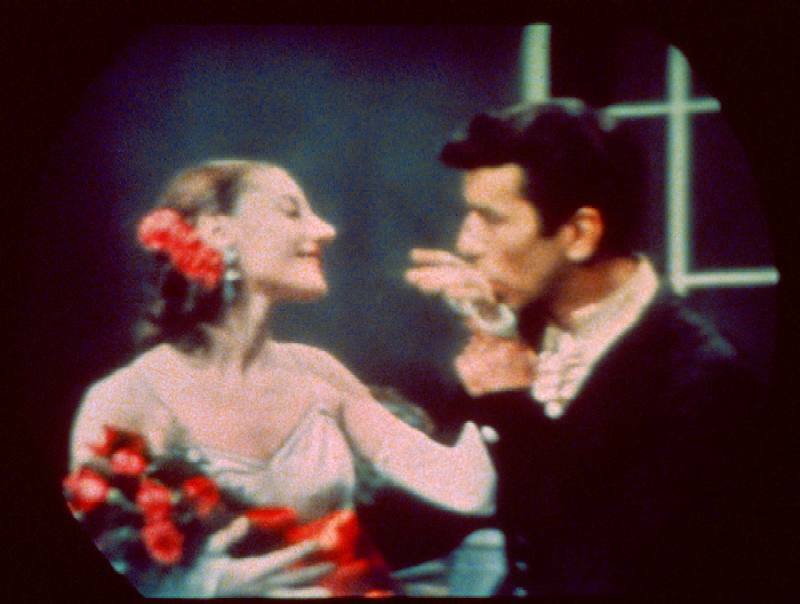 Premiere, the Columbia Broadcasting System’s widely heralded full hour of star-studded entertainment, featuring Arthur Godfrey, Ed Sullivan, Faye Emerson, Garry Moore, Sam Levenson, Patty Painter, Robert Alda and Isabel Bigley, the New York City Ballet, the Bil Baird Marionettes, and Archie Bleyer’s Orchestra, took its place in history as the first commercial color television broadcast to the public. Brief addresses by Wayne Coy, Chairman of the Federal Communications Commission, William S. Paley, Board Chairman of the Columbia Broadcasting System; and CBS President Frank Stanton signalized, in a dedicatory vein, the start of regular color television broadcast service to the public by the CBS-TV Network. The history-making broadcast was carried in New York by WCBS-TV, as well as by CBS-TV Network stations in Boston, Philadelphia, Baltimore and Washington, D.C., the color signals going out over the stations’ regular transmitters and on their regular channels. Originating in CBS-TV’s Studio 57, at 109th Street and Fifth Avenue, New York, the color program was transmitted from Studio 57 by coaxial cable to CBS-TV’s Master Control in the Grand Central Building, New York, and carried from there by telephone cables to the WCBS-TV transmitter and by cable to the network. Thousands of the public, as wellas public and industry leaders and members of the press, saw the color inaugural in the five cities carrying Premiere. 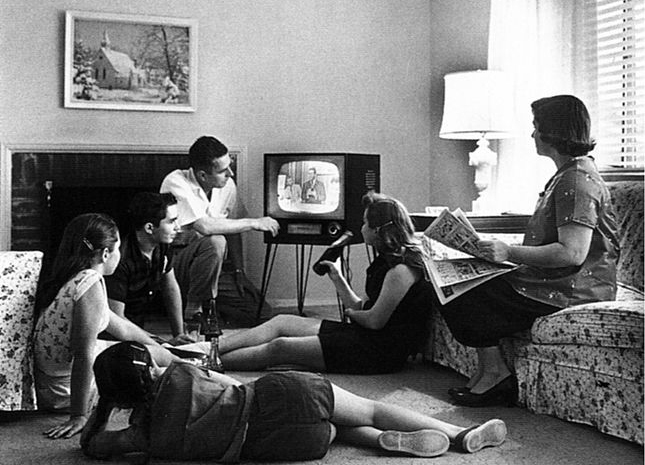 Many of the public who had completed home made conversions of their black-and-white sets also wereable to see the historic broadcast in color in their homes. Typical were the two junior high school youngsters in Newark who last week revealed they had been watching CBS color television transmissions for the past 18 months. In New York, Mrs. Eleanor Roosevelt and Bernard Baruch were among the dignitaries and newspapermen who watched the inaugural on color receivers installed at CBS headquarters. There were also several showings in New York by dealers who are making color television eqUipment which they soon will have ready for the public. Among these were Colortone Inc., which had more than 400 dealers watching the inaugural on sets installed in its downtown headquarters, and Muntz-TV, which showed its new companion-piece in action to the public at its Queens headquarters. In Boston, the public watched the program on a receiver set up in the Jordan Marsh Department Store, first store in the country to order color television equipment florstore use; Boston public leaders the press viewed the broadcast on CBS-Columbia sets installed in the Hotel Somerset’s Grand Ballroom. The Philadelphia public saw the color show on a set installed in the lobby of WCAU, CBS affiliate, with clients, public leaders are press watching the program on another color set in the WCAU Auditorium. Baltimoreans viewed the show on sets installed by WMAR-TV in the lobbies of the new Sun Building and the old Sun Building. In Washington, D. C., WTOP-TV had sets in the Warner Building and at its transmitter at 40th and Brandwyne. In addition top government officials viewed the color inaugural on a set in the Hotel Carleton. The Premiere broadcast was a breathtaking spectacle. His famous red hair and freckles lent an added brilliance to the wit and charm ofArthur Godfrey as he sang and quipped; a bronzed Ed Sullivan greeted a new audience in a. setting vibrant with full, natural color; Faye Emerson was hostess. On still another stage that brought to viewers all the richness of paintings from the Metropolitan Museum of Art and ·the Museum of Modern Art; and members or the New York City Ballet “were ecstatically colorful in Maurice Ravel’s “La Valse,” staged by Sol Hurok with choreography especially for television by George Balanchine. Garry Moore and Sam Levenson added a note of comedy mixed with philosophy, against a setting as vivid as their artistry; Robert Alda and Isabel Bigley of the smash Broadway musical Guys and Dolls sang a duet; the Bil Baird Marionettes cavorted in a riot of hues; and “Miss Color Television” herself, Patty Painter, a. veteran of more than 1,000 CBS color demonstrations and transmissions, brought to life the full, rich, rich colors of the commercial products introduced by the new medium’s pioneer advertisers. Sixteen national advertisers participated in the epoch-making inaugural, constituting what is believed to be the largest such group ever to sponsor collectively a single network broadcast. The pioneering advertisers were General Mills, Lincoln-Mercury Division of the Ford Motor Company, Longines-Wittnauer Watch Company Inc., Pabst Blue Ribbon Beer, William Wrigley Jr. Company, Revlon,Thomas J. Lipton Inc” National Biscuit Company, Toni Home Permanent, Monarch Finer Foods, Procter &Gamble Company, Standard Brands Inc., Quaker Oats Company, Best Foods Inc., Pepsi-Cola Company and Liggett & Myers Tobacco Company. Fred Rickey, executive producer for color at CBS, produced Premiere and shared directorial duties with Frances Buss, under the over-all supervision of Jerry Danzig, CBS color program supervisor. Set designers were Paul Sylbert and Michael Baronoff. The launching of CBS’ regular color television broadcast service to the public was accomplished merely by the addition of the three color cameras, plus monitors and associated control room equipment, to black-and-white studio facilities already existing before the inaugural program in Studio 57, which was chosen for the color broadcast simply because it had suitable time availabilities. So effortless was the inauguration or regular color television service that the necessary technical work and installations in the studio were made in a 12hour period, between 10:00 PM last Wednesday, and 10:00 AM, the following morning, when rehearsals for the first commercial color telecast started. A cue, thrown this afternoon from the control room of CBS·TV’s Studio 57 to technical personnel on the studio flooritself, opened the color Premiere. A still life picture of an orchid and a book was transmitted to waiting thousands, and the curtain was raised on history’s first commercial color television broadcast. Today’s inaugural broadcast, establishing regular color television service to the public by CBS-TV, will be followed by daily morning and afternoon network-programs, commercial and sustaining, beginning tomorrow. A pattern of gradual expansion will be carried out, with a color schedule of approximately 20 hours a week expected by fall. Second or the regularly scheduled color programs, Modern Homemakers,” will make its bow before the color television audience, as a five-a-week series, on Wed., June 22 (CBS-Color.TV, 10:30-11 AM, EDT Mon. thru Fri,). A cookery and homemaking program conducted by culinary expert Edalene Stohr, Modern Homemakers will specialize in menu-planning, food preparation, and demonstrating the eye-appeal of well-prepared foods, with emphasis on other facets of homemaking as well. Opening of regular color broadcasting acted as an additional spur to the public to order color equipment from television dealers. Manufacturers or color TV adapters and converters reported they are receiving thousands of calls for such equipment. Typical was Arnold H. Klein, Vice President of Colortone Inc., who said his company was turning its full facilities over to the production of adapters, and that he expected to have 3,000 units in the hands of distributors by the weekend. He said he had received calls for more than 5,000 sample units from leading department stores and distributors from all over the country. More info. A complete rundown on color TV’s early history. And, a review.